I was kind of dreading the marathon. It’s 26.2 miles. Who in their right mind would run 26.2 miles at one time. 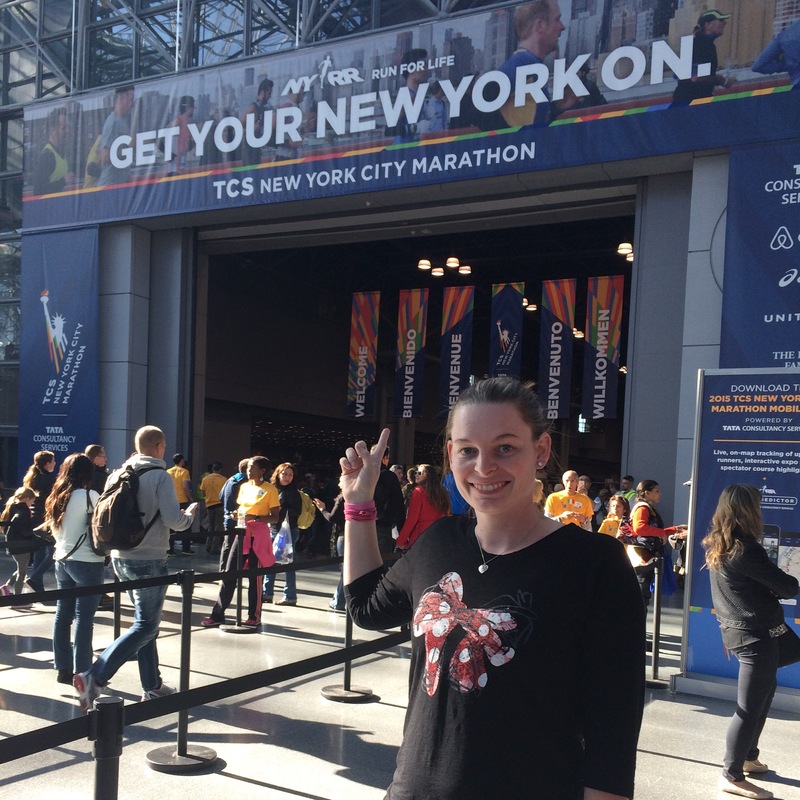 I was crazy enough to run 26.2 miles before, but heck this was a lottery so my chances were very low that I was going to get a chance to run NYC. I mean 50,000 people are running, some with a charity and then the elites. Some qualified through the 9+1 program and then some were just plain fast enough. I thought why not, because chances are, I won’t get it. Well I was plain wrong. I got in through the lottery. (insert shocked emoji here). When I was first notified, it was a moment of shock and then the oh no moment took over. Then the well I need to find a hotel stat! I looked at a bunch of information and decided to stay at one of the official marathon hotels since it was .5 miles from the finish line. It would be easy for my Mom to see me finish and then meet me back by where we had determined a spot. I made train reservations. We had never traveled by train but I was not paying $300+ per person for plane tickets when the train was just over $100. And the train was such a great choice. It was so relaxed and so neat. I would definitely go by train again given the chance. It was definitely worth it. My Mom and I arrived Friday around 1pm and made our way to the hotel. Walking through NYC with luggage, yeah good luck. HAHA. After we checked in, we made our way to the Expo to get my bib and I was getting anxious and nervous. I knew my training could have been better, so I didn’t even know what to expect. I had expectations but I also knew that I had to keep them in check knowing that my training could have been better. I would do the same thing when I swam competitively. I would have, and still do have a hard time eating when I get anxious/nervous about a race. We went to a local Irish pub for dinner and I had this marvelous mushroom ravioli. It was delicious. After dinner, we were both exhausted and went back to the hotel to relax and lounge and try to figure out where and what we were going to be doing on Saturday. It wasn’t much before 8:30 and we were done. HAHA. Saturday morning came and we walked up to the finish line and to scope out the grand stand seating so Mom could see where she was going to be able to see me at the finish, after 26 grueling miles. I was getting more nervous and as we walked in Central Park back towards our hotel, we were making small talk and admiring the enormity of what was going to take place the next day. Me at the finish line, the day before the actual race. At least I was. I dropped my mom off at the hotel and kept walking. I walked down to the Empire State building and past the New York Public Library. I needed to catch the bus there the following morning. Then I walked up to Rockefeller Center. I didn’t realize it was that small. I guess when I was there briefly before, it was so much bigger or so it seemed. Then I made my way back to the hotel to take a nap before getting all of my stuff together for the next morning. Pizza was in order for that night and then we were watching TV while I got my race outfit together. It was starting to feel real by this point. 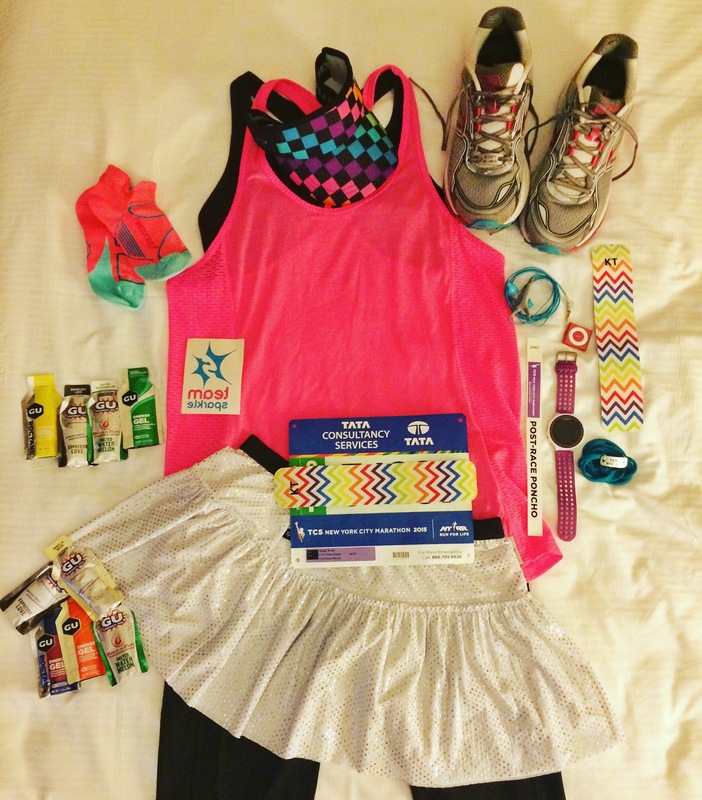 The oh my gosh was settling in and the I can’t believe I’m doing this tomorrow. I got my outfit together and made sure I had everything I needed. I was use to running with my camelbak but those weren’t allowed on the NYC Marathon course. SO, I had to make alternate plans for my GU and phone and music. Lots to think about for sure. I definitely had to take the obligatory flat runner picture the night before and moved all my stuff to a pile so I could find it the next morning. One good thing about this race, is that daylight savings was ending so we got an extra hour of sleep. But that was one more worry. I had to make sure that I woke up at the correct time so that I could get to the bus. Never fear, I did wake up on time and got ready in no time before heading to the bus. Our hotel had fresh fruit in the lobby for us, so I grabbed an orange and headed towards the New York Public Library. It was a great weather morning. Just some minor sprinkles, and it was a decent temperature. I got to the line for the bus and it was snaked around and we quickly made our way to the front and loaded up for our way to Staten Island. It wasn’t a bad bus ride, it took maybe an hour. I wasn’t due in my corral until 10:20 so I definitely had some time before heading there. I made it through security, stopped at the line for the portapotty and then headed to my green staging area for my bagel and coffee and to see what else they had. I made my way back to the big screen to watch the other wave starts and sat down. No need in standing if I didn’t need to. I was able to watch the wheelchair and the pro women start as well as wave 1. It really started to settle in by that point, that I was, in fact, going to run these 26.2 miles through New York City. My covered Garmin to keep my mind off the time. Eventually, I made my way to the corral and made another pit stop. They had the bathrooms in the corrals! Never had that before. We made our way to the bridge and before we knew it, we were started! Holy crap..I was running this. The first few miles seemed to fly by rather quickly. I had covered my garmin watch with a piece of KT Tape so I wasn’t looking at it. I had set it up to run 4 minutes and walk 1 minute. It was set to vibrate when I needed to walk or run. The race started and I tried to not go out fast like everyone does. And before I knew it we were over the bridge and through mile 4. Then in a blink of an eye mile 10 was right there. I was feeling incredible and not too tired. With my watch covered, I was able to keep a pretty even pace which was good. 20k hit and well, I had to make a stop. Wasn’t banking on that happening and it was a several minute stop. But I picked myself back up and kept right on trucking. I hit the half mark and was starting to wain a bit, but I kept up with my 4 min run/1 min walk except for the hills. 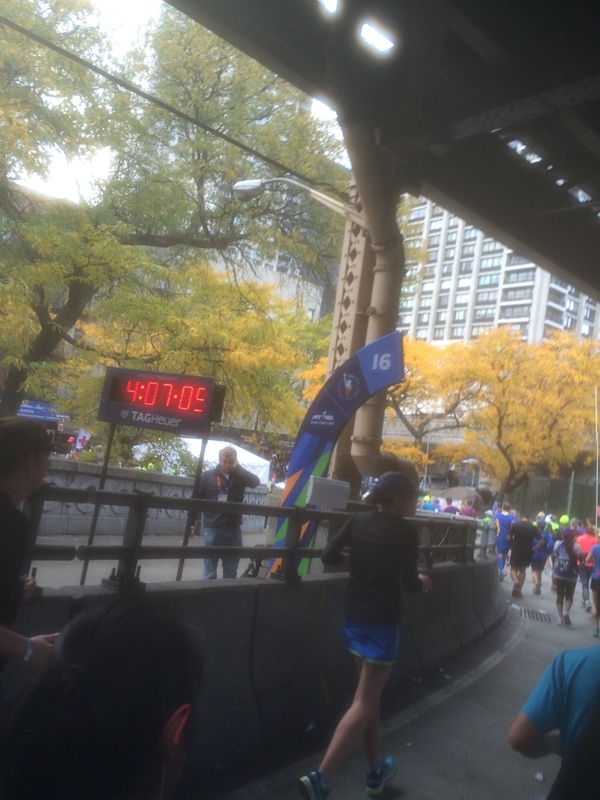 Mile 16 coming across the Queensboro Bridge was awesome! The people were lined up along 1st Avenue waiting for all of us to get there and cheer us on no matter what. 16-19 something were in Manhattan. I was looking at my phone every so often and saw a lot of texts and photos from people that were following me. And not to mention the Facebook posts and comments. I was surprised and in awe that, that many people were watching my progress throughout the day. Things started to get a little tough along this stretch and I still ran when I could but started walking a little bit more. Mile 20-21 were in the Bronx. It was so fun to see the different parts of the city and before I new it there was the sign that said “This is the last bridge” while we were running back into Manhattan on 5th Avenue. You would see the trees of Central Park up ahead. By this time, my mom had gotten to the grandstands for the finish and she told me where she was waiting for me. Getting to Central Park seemed to take forever! But knowing that I only had so many miles left was what kept me going as well as the people there cheering for all of us. We turned into Central Park and I had 2.2 miles left to go. There were lots of people in Central Park and they were cheering for everyone. I came around the last curve, and saw mile 26. I texted my mom that I hit 26 and I could see the grandstands just up ahead. She was on the east side, standing up at the top. I saw her right away in her pink top. She didn’t see me right away, and I could see her scanning the runners looking for me. I got to an open section and starting jumping up and down to grab her attention and I certainly did. I don’t know how I was able to jump up and down either at that point, I don’t know if my feet left the ground. But after we saw each other, I continued on down the stretch to the finish. I crossed the finish line in 5 hours, 29 minutes and 58 seconds. I did it! 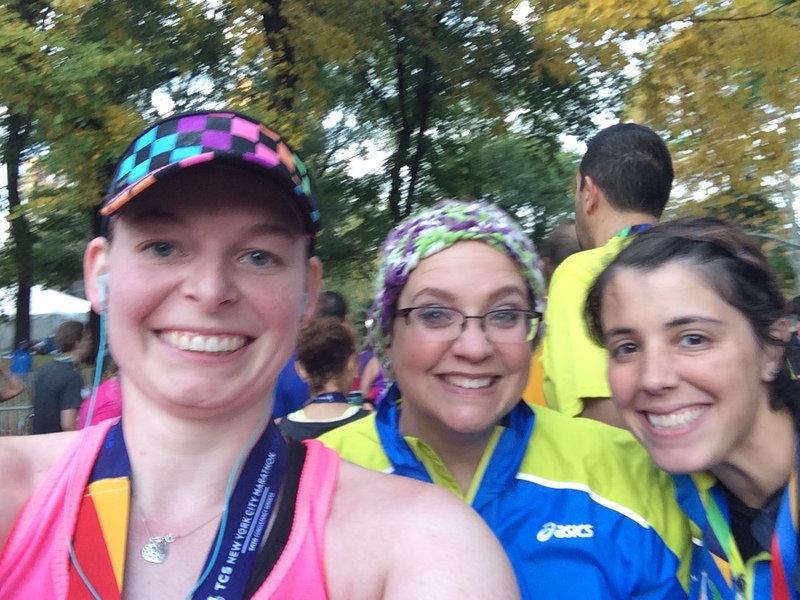 I just ran the TCS NYC Marathon! This wasn’t about a PR for me, I just wanted to finish and have fun. I am still in shock that I was able to cross the finish line close to my PR, so maybe there is hope in the future to get under 5 hours. 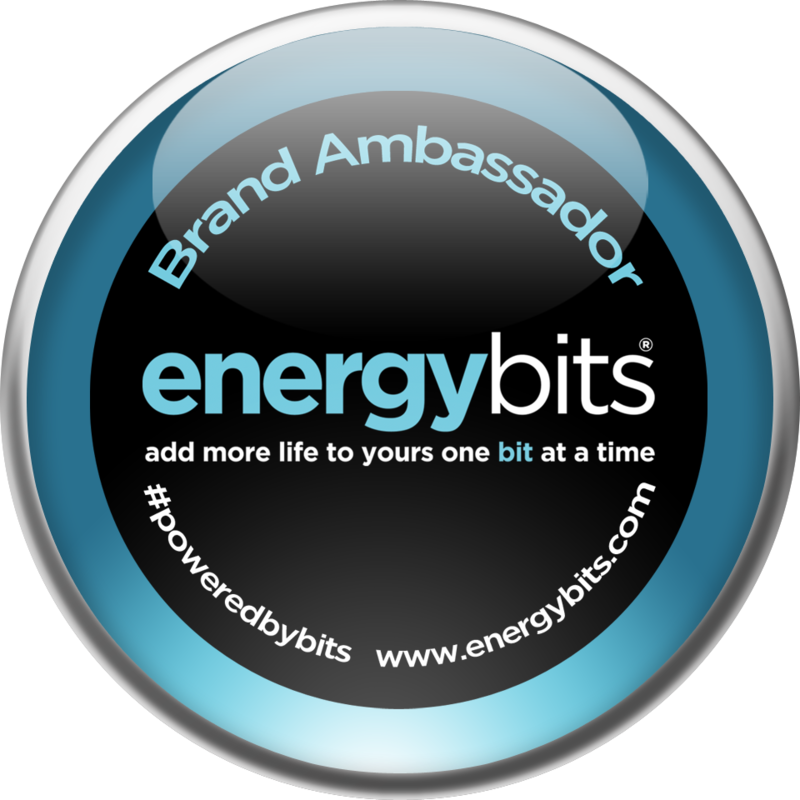 I got my medal, and 2 awesome ladies on Instagram were there at the medal station and they found me. We had sent comments back and forth a few times but now we got to meet in person! It just makes the day that much more special! They both will be running the NYC Marathon next year and I can’t wait to follow their journey! After my obligatory medal picture, I even took a selfie to send to everyone I knew, I got my heat shield and one of the volunteers taped it for me so I didn’t have to hold it. Then I made the long trek to get the bag of food and make my way to get my poncho! The lovely poncho! It’s like the supreme poncho of ponchos. HAHA. It’s fleece lined and velcro closure. It definitely kept me warm as I walked back to 62nd Street to meet my Mom. I gave her this huge hug and started to get teary eyed. 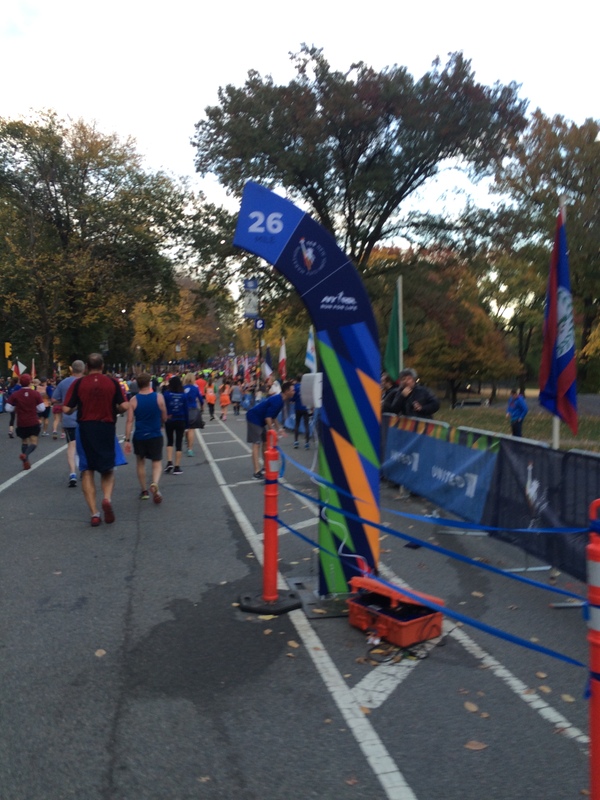 The NYC Marathon was a fantastic experience! I would not hesitate one second to go back and run it again. The people that lined the streets, the bands and DJ’s, the volunteers that made it all possible! It was huge accomplishment for me and everyone else that ran it. 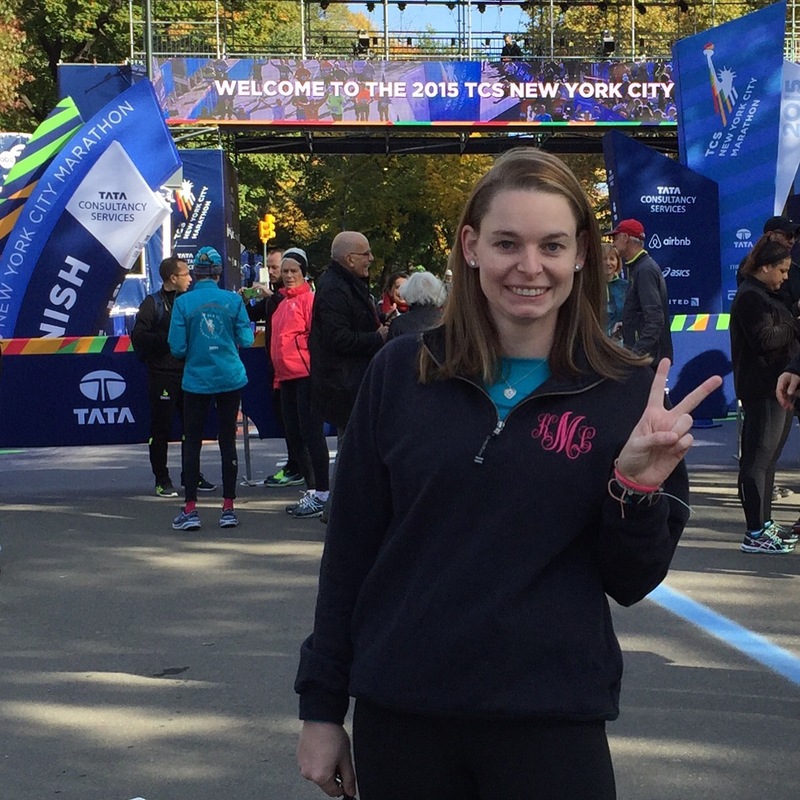 I’m so thankful for the opportunity to be apart of the 2015 NYC Marathon! Aww thank you! I had a fantastic day and I hope that you get to cross this race off your bucket list! It was a well run race for sure! I am so stoked to have finally meet you! It seems like we were always in the same place but at different times! Lol you are a ROCKSTAR and an inspiration! I was so stoked to give you your medal and be able to find you!!! Can’t wait to hang again soon!!! May the roads forever rise up to meet you and may the wind always be at your back! I kept thinking on the race course “I HAVE to find Matsui_runs! I know she’s there at the finish line” HAHA You are an inspiration and thanks for all the encouragement throughout my training! I do hope we end up at a Disney race together soon! Good luck in your training! Loved this race. Totally amazing day! Congrats to you!!! Congrats to you as well! You did awesome! Aww Thanks Momma! Thanks for joining me up there and dealing with all my crazy for the weekend 🙂 It was so much fun to have you there! Congrats on your major accomplishment. I am training for my first marathon next May. Love your mantra bracelets. Where did you get them? Hi! Thanks so much! 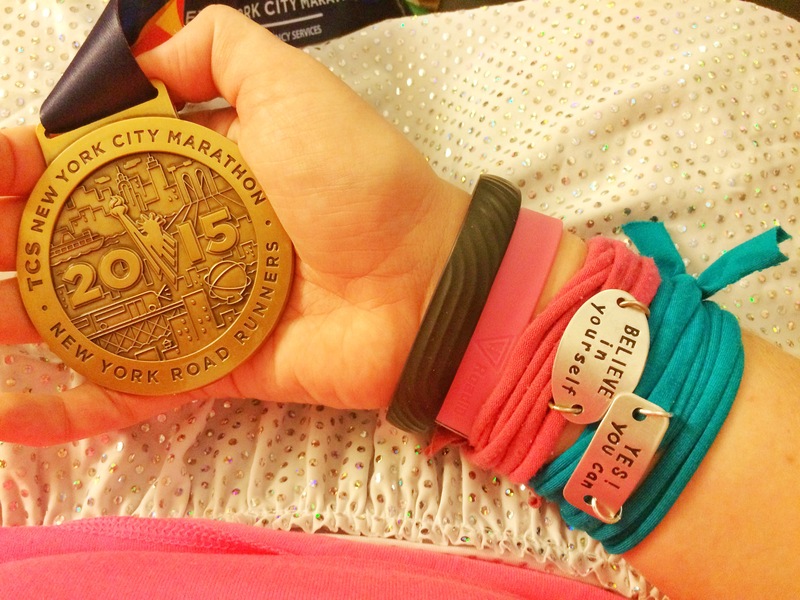 Which marathon are you training for? 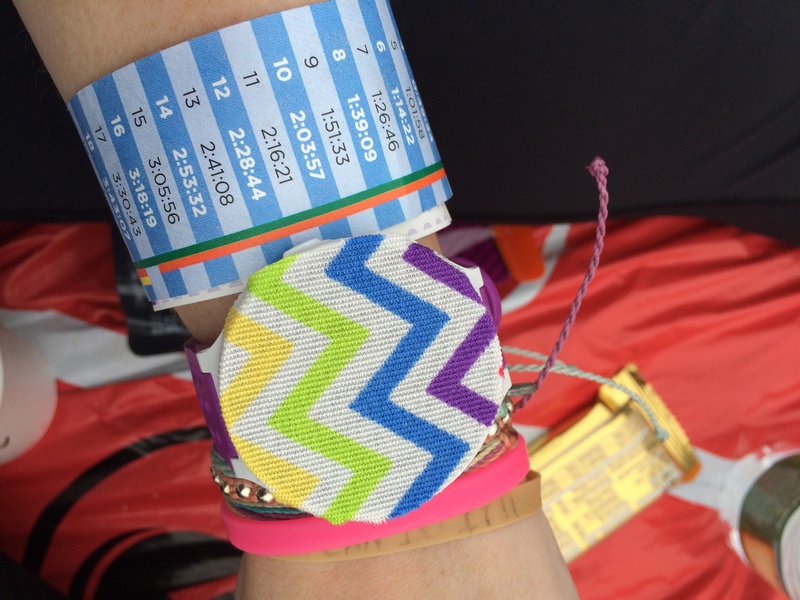 I got my mantra bands from Momentum Jewelry http://www.designsthatmoveyou.com. Love them! Great job!!! Where did you get your lovely mantra bracelets?